There’s something about a defined blog aesthetic that has me adding it to my favourites. And a huge component of an aesthetic is the imagery. Whether this is due to a colour scheme or there’s a certain style about the pictures – good imagery is so important. Fee over at Makeup Savvy has a great pack of stock images that are ideal if you really love your flatlays! In the pack of 10, there’s something for everyone – from autumnal flatlays to coffee cups to books to makeup brushes. It’s a great set to have on hand! You’re able to use these for both personal and commercial use but whilst you don’t need to credit her, she does suggest it! Owned by the people behind Spotify, Burst is probably one of the largest and easiest to navigate websites out there. There truly is something for everyone and it also has the widest range of free flatlay and desktop images that I’ve seen. All the images are really high quality and are licensed under the CC0 (copyright free) and again, can be used for personal or commercial use. I promise this is the only site on this list that costs but it’s definitely the best place to go first. This is my number one for any graphics, illustrations, textures, fonts and stock images for my blog as they’re all incredibly high quality and versatile. You can either buy individual stock images (between £5-20) or bundles (which can cost up to £100) so it depends what you’re after. Once you become a member, you regularly get sent free packages, which are always stunning! Personal favourite artists include Her Creative Studio & Linea May. These are very blogger. Think minimal, floral and impeccably styled and you have this set of 20 free images. The set contains a mix of landscape and portrait, which is great. You’re able to use these for all your personal needs and are able to edit them however you like. But if you’re after these for anything commercial (eg. a paid ebook), then you’re going to have to purchase an extended license. Yet again another source of high quality images. These are very much scenery based and cityscapes as opposed to what some of the other sites offer, but beautiful images regardless. Because of the quality, the site feels slightly clunky and isn’t the easiest to navigate so I’d suggest scrolling through it and saving your faves. Licensed under CC0, they can be used for either personal or commercial use. Beautiful images. However, they’re all landscape which although would work with blog posts, might not translate perfectly across to other sites like Pinterest. Mainly scenery, the content is ambiguous enough to make them work with a wide range of content. Not all the images are licensed under the CC0 so it’s worth checking before you download anything. This is my favourite source for all food photos. Not only are the photos dreamy and look like they’ve jumped out of a recipe book, but they’re ideal for lifestyle content! There’s a huge range of photos with a variety of aesthetics and colour schemes so there’s bound to be something that works with your blog. The site is a bit clunky so I’d recommend scrolling through it and downloading your favourites. All licensed under CC0 and available for commercial and personal use. So those are some of my favourites. But watch this space for a stock image bundle from yours truly…. 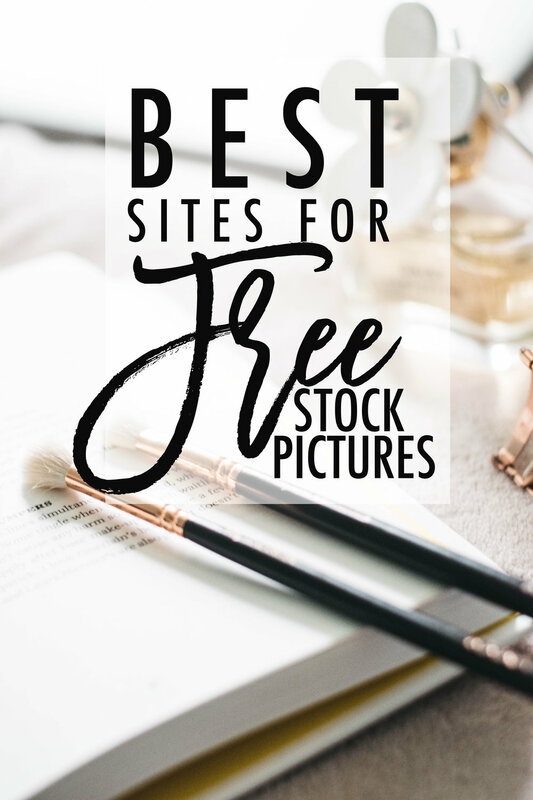 Do you use stock images at all? What type of image do you tend to look for? Don’t forget to share this post on Pinterest if you loved it!